Most sportscasters and NBA analysts will tell the story of Jeremy Lin in the context of how the breakout star is saving the New York Knicks’ season, especially through this tough stretch without the multi-million dollar stars, Carmelo Anthony and Amari Stoudemire. But the analysts with the ability and foresight to look at the big picture implications can easily see how this guy might be the guy to save the entire league. I’ve spoken at length about how the NBA needs a hero. The downward spiral they’ve been on for years is fueled by this flux capacitor of selfishness with the increasingly egomaniacal players, the press who get paid to give the fans a story they want, and the fans that are being manipulated into believing in stats and the importance of winning by the machine. This is what we’re feeding our kids. The only way out of this mess is to find a selfless hero to give the press something to write about that the fans can appreciate. Which means he needs to be a winner, first and foremost, to sustain a public image. Kobe was that guy for years until the sexual assault charges ruined his Food, Folks and Fun image. LeBron was for a while too until he finally got tired of pretending he wasn’t an arrogant blowhard. And not that Jeremy Lin is going to ever reach the talent level of those two, but if he continues with this streak that he’s on and makes waves in the playoffs, he could be the story that saves professional basketball. Some don’t believe the NBA needs saving. I understand. They still have fans. But I did something I hadn’t done in seasons. I watched a game. Well, the last 8 minutes of a game, but still. The NBA has become about highlights and contracts and superstars who score 35 points on 45 shots (that’s not very good). I was really hoping the entire season would be locked out to hopefully teach it a lesson. Then up from the ashes comes a humble Harvard Asian-American point guard who has been sleeping on his brother’s couch through the 10-day contracts he’s gotten from the Knicks. And he’s done it to not just the Wizards and the Jazz, but now the beloved Lakers. He has garnered the attention of the casual viewer, like me, who has tired of watching the chest-pounding, showboating ways of today’s NBA. This doesn’t seem like the kind of guy to fall victim to an egomaniacal tirade or a run-in with the law – probably not even a parking violation. And the timing is perfect. He’s come to the forefront of our focus just after football season, when a lot of us are searching for something to merit our attention, and just at the tragic fall of one of the best role models in all of sports history with the Penn State saga. 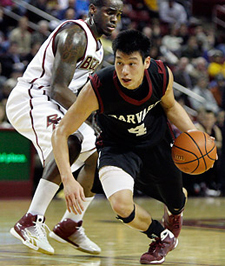 He is the first person of Asian-American descent to start a game in the NBA and the second Harvard grad. He has already become an international star and has increased traffic on the Knicks websites by 3000%. I’m looking for a role model. Someone to inspire kids to play for something besides showing up other kids and end zone celebrations. This is my hope for the NBA and sports in general. I’m putting all my chips in on the Lin-sanity craze. And maybe it’s too early. Maybe he won’t be the superstar I’m hoping he’ll be, and thus may fall out of the spotlight. Maybe once Carmello comes back, the team chemistry will fall apart and he’ll fade into the background. Or worse, maybe the NBA will lose their focus on him and start to spotlight Carmello and the stats again. But hopefully the media and the fans can keep their attention on him for a while, for whatever reason. Because in a league that’s more common to high school dropouts than Ivy League grads*, it would be nice for a humble Harvard kid to share some of the spotlight. For the kids.